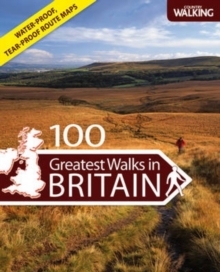 These 100 Greatest Walks have been chosen by Country Walking magazine, Britain's most popular walking journal. This is a marvellous companion for all those who enjoy walking and hiking in the British countryside. The book highlights the extraordinary variety of scenery in the UK and on many walks it is possible to mix and match landscapes to awesome effect. This practical guide provides you with all the information you need to select a country walk and then to enjoy a day's walking. Split into regional sections, each walk guide includes: * a map (taken from the OS maps); * a detailed route guide; * information on how to get there, where to park, refreshments, toilets, etc. * detailed advice on how long (in distance and time) and how difficult the walk will be; * each walk is printed on amazing waterproof and tear-proof paper and bound in a practical ring-binder so you can take individual walk guides with you on the day. The walks in this collection will guide you to fascinating places and magnificent views, creating memories you will cherish forever. The guides offer a wide variety of walks from easy strolls to more challenging hikes so there is something for everyone. They are compiled by experts who know their patch like the back of their hands, and who skilfully link paths and tracks to make your walks as smooth as possible.